The Chesapeake Bay is the Atlantic Ocean’s largest nursery for young menhaden—the fish that feeds much of the East Coast’s marine food web and is the target of intense commercial fishing here. In 2006, when managers first set a bay catch cap—or limit on menhaden fishing—they recognized that taking too many could harm predators and mean that not enough young menhaden would survive to create the next generation of fish. Last November, the Atlantic States Marine Fisheries Commission, an interstate body that manages commercial fishing, voted 14-2 to set a catch cap in the Chesapeake Bay at 112 million pounds, close to the average catch in the Bay over the last several years. Thousands of citizens supported this decision to conserve the bay, which continued the commission’s tradition of stewarding fisheries based on sound science and consultation with a range of stakeholders. But in the following months Virginia, which catches nearly 80 percent of all menhaden landed along the East Coast, failed to adopt the cap, despite a commission requirement that its members do so. Virginia also appealed to the fisheries commission to raise the cap significantly—by an amount roughly equal to 120 million fish—arguing that the menhaden population is healthy and that a big increase in the bay catch would not negatively affect the overall population. 1. The Chesapeake Bay is Atlantic menhaden’s most important nursery. Every year, currents carry millions of menhaden larvae from the ocean into the bay. The calm, protected waters offer young fish their best chance to feast on their primary food source, plankton, and juveniles that survive their first year return to the open ocean. Historically, around 7 out of 10 menhaden swimming in the Atlantic spent their first year in Chesapeake Bay, but recent science suggests that number has declined. As this sensitive estuary recovers from decades of pollution and overfishing, no scientific evidence supports the claim that the Chesapeake Bay, or the coastwide population of menhaden, could sustain an increase of catch. 2. Menhaden’s predators and coastal communities will suffer if the bay catch increases. 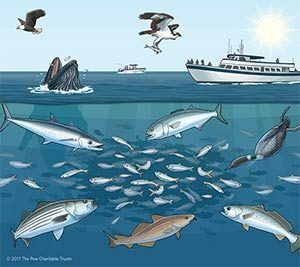 Menhaden are critical prey for many fish and birds, including striped bass, which are the flagship species of the commission and the target of one-third of East Coast recreational fishing trips, generating more than $6 billion in annual economic value. The bay is also the primary East Coast nursery for striped bass, and juvenile striped bass prefer to eat young menhaden, which provide greater nutrition than other species such as bay anchovy. But analyses of stripers’ stomachs have found poorer quality prey such as crabs and worms, suggesting the bass are not finding enough menhaden. The striped bass population is also at the low end of the level managers are trying to maintain. Other menhaden predators, including bluefish and weakfish, are also struggling. Predators that are growing in numbers, including ospreys, loons, and eagles, will increasingly need more menhaden to support them—especially those, like Chesapeake Bay osprey, that rely almost exclusively on menhaden. Managers are not yet explicitly accounting for predators’ needs, and there is no evidence that they can recover or sustain themselves if the catch of menhaden is increased in the bay. 3. Commercial vessels concentrate around the bay and catch many juveniles. The largest fishery by volume in the U.S. Atlantic is the “reduction” menhaden fishery, which renders menhaden into fish meal for aquaculture, fish oil for nutritional supplements, and other commodities such as pet food. More than half of the entire coastwide catch is taken in and around the Chesapeake Bay, and data show that young menhaden make up a concerning portion of that: between 2006 and 2016, 1-year-old menhaden comprised an average of 31 percent—and in some years above 40 percent—by weight of the total commercial landings. Removing too many young fish is risky for the population, because it means there will be fewer fish that reach adulthood to produce the next class of fish. 4. Menhaden in the Chesapeake Bay are not enjoying the comeback seen to the north. While evidence suggests that juvenile menhaden are on the rebound in the waters off New York, Connecticut, and Rhode Island, young menhaden in the bay have been at near-historic lows for over 20 years, according to annual surveys by Virginia and Maryland. This raises concerns that the bay is suffering from “localized depletion,” a term used when a population in a particular place is too low to sustain itself or predators, or both. One sign of that is a marked decrease in how many fish are caught given the same amount of effort—known as catch per unit effort—and that metric has declined notably in the Chesapeake Bay. 5. The bay cap prevents further harm while menhaden and their predators are struggling in the bay. Scientific studies have demonstrated that all the conditions that could cause the bay menhaden population to decline currently exist. In addition, scientists could not prove that the bay was not enduring localized impacts of heavy fishing. In response to these warning signs, scientists recommended managers take a precautionary approach and integrate ecosystem considerations into menhaden policy. The commission’s November decision to reduce the bay cap from 192 million pounds to 112 million pounds—a number based on the average of several recent years of catch—was a response to that advice. Until scientists can confidently recommend an ecologically sustainable limit for the bay, the reduced catch cap is necessary. Successful menhaden management requires that each state play by the rules. Rather than reversing a 14-2 decision that is widely supported by the public, the commission must hold the line on the Bay cap to protect menhaden and its predators. Atlantic managers must not compromise their core mission of conserving fisheries, nor their legacy of integrity, cooperation, and public confidence. Protecting the East Coast’s largest menhaden nursery will help the species recover in the Chesapeake Bay and return to abundance in its full historic U.S. range, from Florida to Maine. Only then should the commission consider increasing fishing of this vital species in its primary nursery. of course, they are but you Mr. Creed will not challenge them, your electronic paper will not do so, you have the power to sway the politicians locally and Richmond and U.S.Govenment. This free giveaway Mr. Creed has the local commercial fisherman, tourist, homeowners suffering to make a living, attract tourist, and put food on the table of low-income families, but you prefer to write about it but not challenge the Menhaden boats, Delaware state, Maryland State don’t allow it but Virginia does. Mr. Creed gets a petition of the Accomack an Northampton telling the Politician to send the Menhaden boats to go away and don’t come back. You will get the Nobel Prize.